Welcome on the Herschel Database in Marseille. 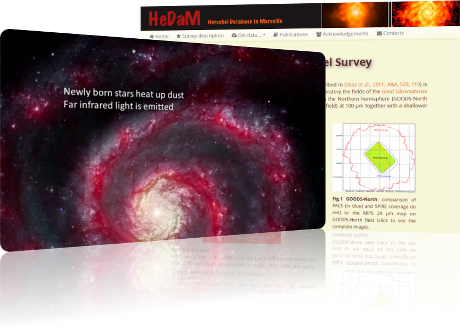 HeDaM is dedicated to hosting the data of some of ESA's Herschel space observatory key programmes. HeDaM is operated by the Centre de donnéeS Astrophysiques de Marseille (CeSAM) of the Laboratoire d'Astrophysique de Marseille (Aix-Marseille University / CNRS). July 1st, 2016: Fourth HerMES data release (DR4). July 15th, 2015: Third HerMES data release (DR3). The Herschel Multi-tiered Extragalactic Survey (HerMES) is an astronomical project to study the evolution of galaxies in the distant universe. It is the largest project on Herschel space observatory (900 guarantied hours). If the HeDaM/HerMES database was helpful for your research, please read the acknowledgements page of the site. The Herschel Reference Survey (HRS) is a guaranteed time Herschel key project and will be a benchmark study of dust in the nearby universe. The survey will complement a number of other Herschel key projects including large cosmological surveys that trace dust in the distant universe. HeDaM holds the result data of HRS project as well as some ancillary data used in HRS publications. If the HeDaM/HRS database was helpful for your research, please read the acknowledgements page of the site. The Very Nearby Galaxy Survey (VNGS) is a guaranteed time Herschel key project aiming at measuring the emission spectrum from dust as well as important cooling lines from the gaseous interstellar medium in a sample of 13 very nearby galaxies. 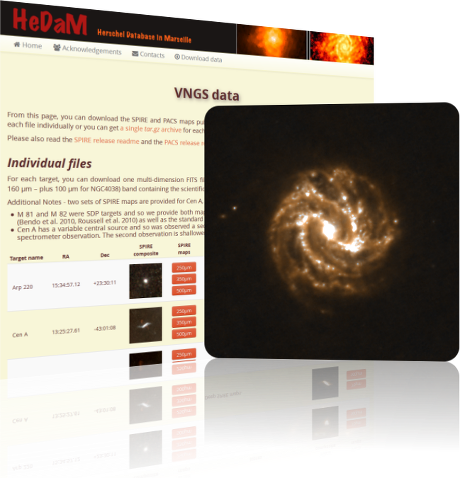 The public data of VNGS is published through the HeDaM Site. If the HeDaM/VNGS database was helpful for your research, please read the acknowledgements page of the site. 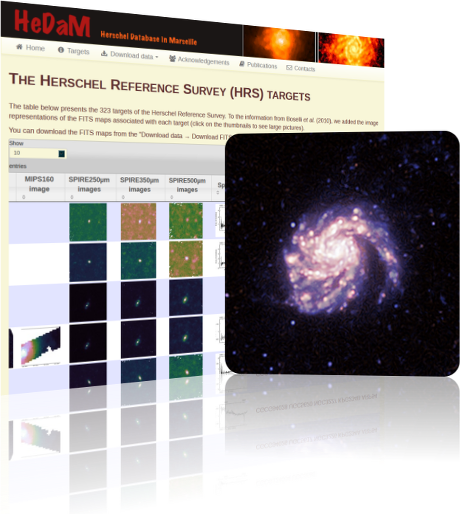 The GOODS-Herschel survey is an open time Herschel key programme of more than 360 hours of observation with the instruments SPIRE and PACS from 100 µm to 500 µm on the two fields of the Great Observatories Origins Deep Survey (GOODS). 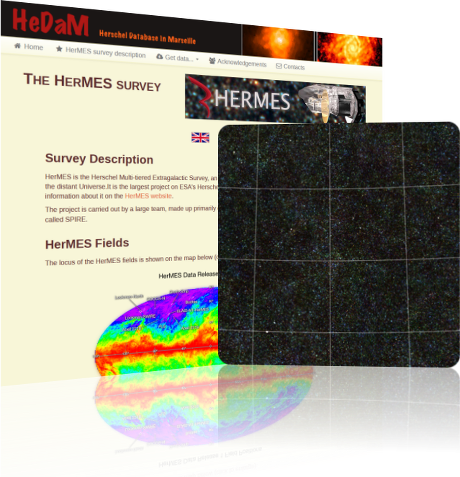 The public data of GOODS-Herschel is published through the HeDaM site. If the HeDaM/GOODS-Herschel database was helpful for your research, please read the acknowledgements page of the site.